This picture was taken in 2009--140 years later. The top portion of the steeple was added for the 100th anniversary of the church building in 1969, replacing the section which had been damaged previously. 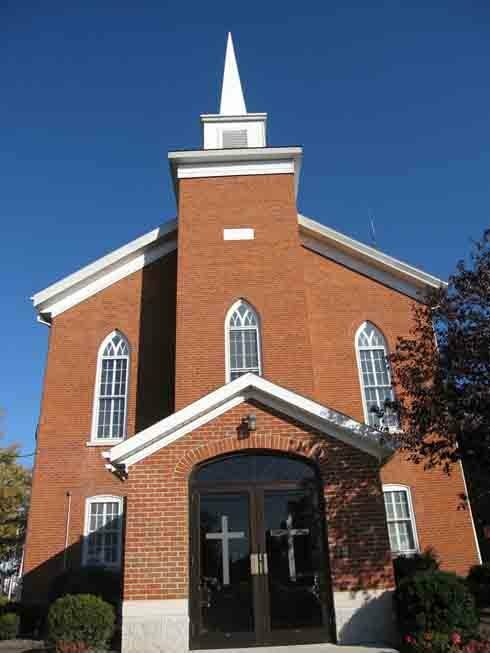 Notice the white block located halfway above the center window and the steeple. This shows the original date of construction in 1867. A two-story addition for classroom space and handicap access was added in 1987. Later, the front entrance was modified to provide a safer entrance to the building--no more icy or rain-slicked outdoor steps. During the devastating August 2007 flood, this new area was the only portion of the building that was damaged. The original part of the structure and the classroom addition remained dry. The pictures that follow show it standing tall during that stressful time.